Maybe I shouldn’t admit this. I mean, I am a homemaker, but I do struggle with keeping the house clean. In all honesty, I’m not just a homemaker. I’m a stay at home mama to two very young children, so keeping a tidy house isn’t high up on my list of priorities, but I have realized that even if the house isn’t super tidy, it still needs to be clean. 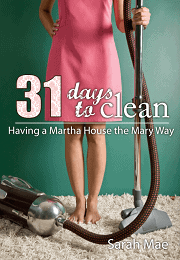 I found Sarah Mae’s 31 Days to Clean: Having a Martha House the Mary Way ebook a few months back. I actually bought it with an Amazon gift card I won from Swagbucks. It only costs $4.99! Recently, I skimmed through the ebook and have decided to actually do the challenges. 31 Days to Clean isn’t just about getting your house clean. This book is a must for the Christian homemaker. It’s an inspiring ebook that causes you to look carefully at why you want to keep your home clean. You will feel empowered to take care of your home not only to keep it clean, but to fill it with love. With the start of fall, I figured it was time to get some fall cleaning done around here. I will be going through 31 Days to Clean every day in October. From what I have already read, the book is very motivational. There are two challenges at the end of each chapter. The Martha challenge deals with your heart, and the Mary challenge gives you a specific cleaning task to do that day. Every morning in October I will read one chapter and will write a short journal entry before I complete the cleaning task. I have wanted to get back to journaling, in an actual book, for quite some time, so I’m excited about this! Look forward to weekly posts every Tuesday in October on my progress as I go through the ebook 31 Days to Clean: Having a Martha House the Mary Way. I will also include a recipe for a homemade cleaner with each post! I can’t wait until I read them! !